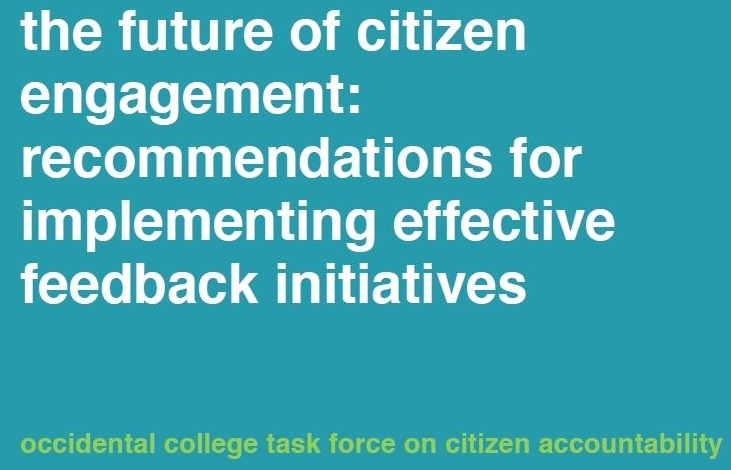 Last week, the Occidental College Task Force on Citizen Accountability launched a report of their research findings entitled The Future of Citizen Engagement: Recommendations for Implementing Effective Feedback Initiatives. This research team, commissioned by the UN Millennium Campaign, assessed a variety of citizen feedback initiatives around the world which focus on incorporating citizen voice into local and national policy and/or service delivery. Among the case studies were UNICEF’s U Report in Uganda, and the MY World local spin-off survey, MY Municipality in Macedonia. For a full documentation of the initiatives which the team encountered through their research, see this interactive map. This research is extremely relevant for the future of the MY World survey. Thus far, MY World has allowed over 7 million people to have their say concerning the next international development agenda. The hope for the future is that people everywhere are equipped with comprehensive tools which allow them to have their say in local and national policy processes as well. These recommendations will serve the UN Millennium Campaign and its partners as they decides how the MY World model can fit into a local or national context. …over the past few years, we have heard the voices of our global conversation and more than 2 million people through the My World survey. It is worth noting that there are more than a million votes for honest and responsive government. We must take the vision of the world’s people into account. We must recognize the strength of each of our many partners. He echoed his commitment to integrating the UN’s analytical and operational work, and of integrating the UN with existing regional and national accountability frameworks. This event coincided with MY World votes for “An honest and responsive government” reaching over 1 million. In the qualitative data collected on The World We Want 2015 it is easy to see linkages between the people’s voices and accountability and governance issues. Explore The World We Want to see data visualizations on the post-2015 process, follow events and outcomes from discussions thus far, and to add your voice to the debate.